Equipped with Intel Turbo Boost Technology 2.0, your computer will have the power and responsiveness to help your productivity soar. Experience amazing gaming performance, seamlessly edit and share 360 video, and enjoy fantastic 4K Ultra HD entertainment. See also Pentium GOLD, Core i3, Core i5 and Core i9 CPUs. 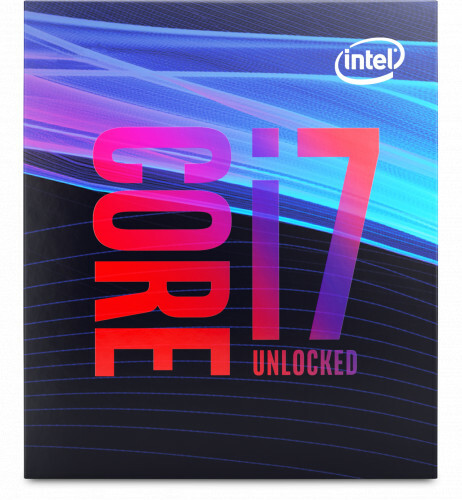 The Intel Core i7 processors redefine mainstream desktop PC performance with up to eight cores for more processing power. Intel Core processor family—Intel Turbo Boost Technology 2.0 to increase the maximum turbo frequency up to 4.7 GHz, and up to 12 MB of cache memory. Intel Hyper-Threading Technology (Intel HT Technology)1 delivers up to 12-way multitasking support in the latest generation of Intel Core processors. For the enthusiast, the unlocked Core i7 8700K and 9700K processors provides you the opportunity to tweak the platform performance to its fullest potential and enjoy great gaming and VR experiences. Intel Hyper-Threading Technology (Intel HT Technology), which allows each processor core to work on two tasks at the same time, improving multitasking, speeding up workflows, and accomplishing more in less time. The ability to set an overclocked ratio per core with unlocked processors,1 when paired with select chipset SKUs, to provide you more control and more granularity for overclocking your platform. Intel Core i7 processor based desktop platforms are loaded with new and enhanced features to deliver amazing experiences that five-year-old systems can't handle. Outstanding gaming experiences extend beyond your personal smooth gameplay to your entire gaming community. The Intel Core i7 processor family makes it easy to share those experiences by live-streaming or recording, editing, and posting your epic highlights. To perform at your best, get a great gaming PC powered by an Intel Core i7 processor that lets you live—and share—the ultimate gaming experience. The Intel Core processor family is a great investment in your desktop experiences—whether for gaming, entertainment, or general-purpose computing wherever your life takes you. From the jaw-dropping performance of the Intel Core i7-9700K processor with eight cores to the practical capabilities of the Intel Core i3 processor, Intel's generation of desktop processors fits a wide range of budgets and needs. Whether you're a performance-hungry professional, an exceptional enthusiast, or a first-time buyer, there is an Intel Core processor that will enable the experiences you seek. If form factor is your priority, the Intel Core processor family offers a range of processors designed for desktop PCs from high- performance gaming towers, to slick, and stylish all-in-ones, to compact living room minis.